It is a scant three weeks since my arrival home from my most recent foray across the Atlantic to not only see the sights in England but ultimately attend the annual reunion of the RAF 158 Squadron Association – my father’s operational Bomber Command unit. It always takes some time to fully absorb and appreciate the myriad events and emotions accompanying these meetings. I believe that I am only beginning that process now. It is always an emotional time. The solemnity of the Memorial Service – the primary reason that we gather-- is more than balanced by the rollicking good times shared with so many good friends and like-minded individuals. I now feel silly that I once felt vaguely guilty for how good a time I had during this weekend. When I consider how it must have been for my father and his friends – sharing gut-wrenching and horrific moments with his friends and crew mates while at other times, numbing boredom, homesickness, or dreadful introspection likely held sway. There were, I am certain, frequent periods of bonding and boisterous belly-laughs – with or without copious libation. Indeed, I can sense their presence at these events – their encouragement is almost palpable. That I feel some ethereal guidance at the Reunion is nothing new. It has a near continual presence through all of the times I have attended. From our first time there when the first person we met upon checking into the reunion hotel was the partner of the son of my father’s crew mate on the night they were shot down (the other air gunner). Our visit to the churchyard of St James of Compostella Church in Lissett that same day turned up the grave of yet another member of that crew, the flight engineer. It felt, then and there, that some things were more than coincidence. Such occurrences have become commonplace for not only me, but so many of us who attend these functions. I am uncertain if other such groups experience these and, although I am seldom surprised at them, they still raise the hair on the back of my neck. 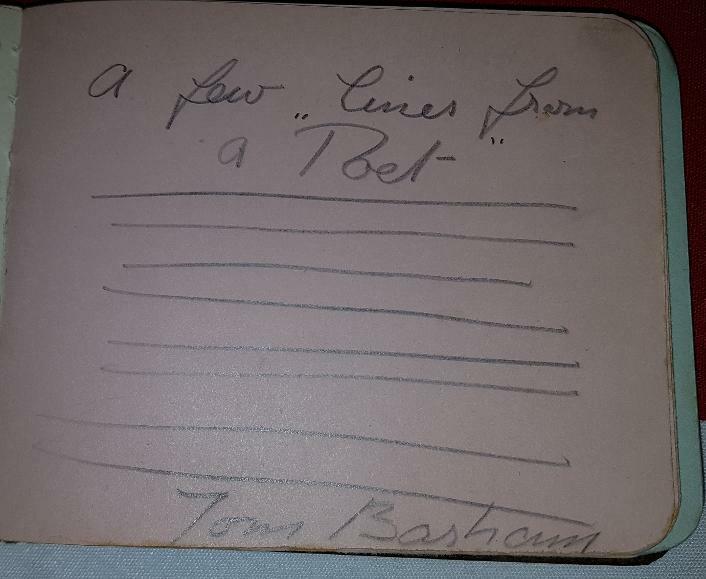 David Evans, our good friend who lives in Lissett village, the site of RAF Lissett (158 Squadron’s home), had, this year, obtained an autograph book that belongs to a long-time resident. Autograph books were, of course, reasonably commonplace from the 1930s to 1960s, when they eventually lost out to other modes of recording personal greetings. As a teenager, this lady was a worker in a cafeteria that helped service the many aircrew and associated personnel of the dispersed base that surrounded the settlement. Carefully paging through the book, I saw many expressions of friendship and hope scrawled by the men who served at this Bomber Command base. I immediately realized what a treasure this was and so, in the manner of today’s technology, I began to carefully photograph each page – hoping to look up these men in the squadron personnel rolls. Of course, I had hoped to find the name of my father or his crew mates but given that there were several thousand people assigned to the squadron at one time or another, the chances of that were slim. Indeed, the times at which most signed the book was either before or after my father’s tenure. I was, however, curious of the outcome of those writing such friendly or even slightly risqué verse in the book. I started a task in my hotel room – checking each name against the list of personnel. Certainly, I could find nearly all I checked. I grew more morose as I found that about half of them had been killed on operations after signing the book. I stopped after checking nine of the forty-odd names – four of them never came back. Such archival work is very emotional. These young men, seldom older than twenty – cut down when their biggest concern ought to have been whom they might meet at the next dance. So much for just coincidence.